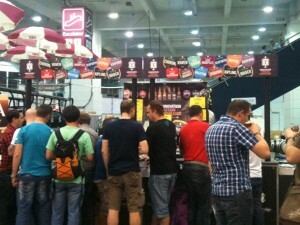 It was epic because of the sheer number of beers you can drink, but in terms of aesthetics the GBBF could improve. 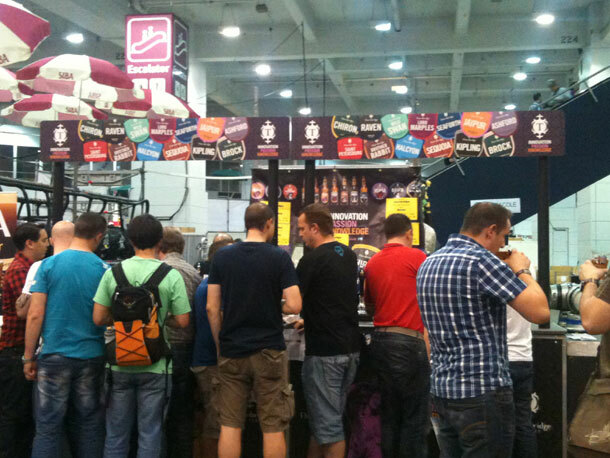 Don’t get it twisted: I explain the basics of Beer festivals in my Guide, but so much more could be done to make this festival way more enticing for novice beer drinkers, some more entertainment or background music and some more beer educational opportunities than were offered. 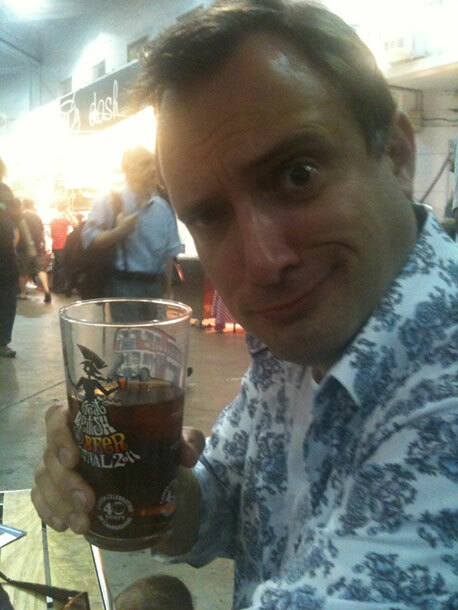 It’s not helped by the fact that Earl’s Court is one seriously DARK hall! But next year it goes back to Olympia, so hopefully it will be more pleasing on the eye. 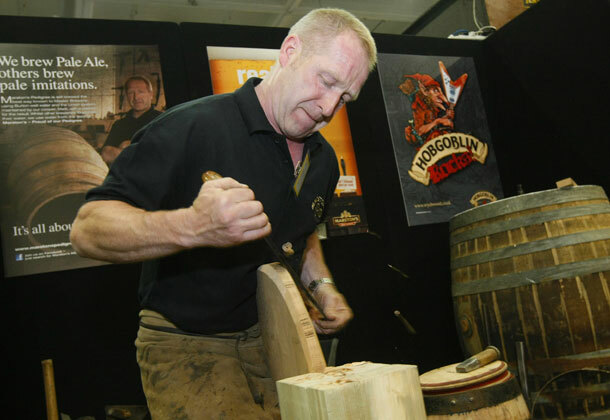 Sadly Melissa Cole’s ladies sessions weren’t on offer but the likes of Marston’s made the effort by bringing their Cooper maker, Mark Newton, along so he could give demonstrations of constructing and de-constructing a cooper. 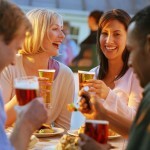 I remember one year Shepheard Neame brought a demonstration of the brewing process, some hops and malt and so on too. More of this, I say. Much more! 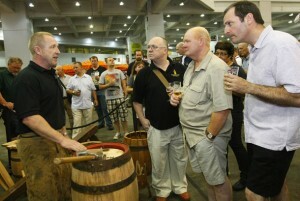 Who's that random guy inbetween me & Glyn (The Rake Bar)?!? 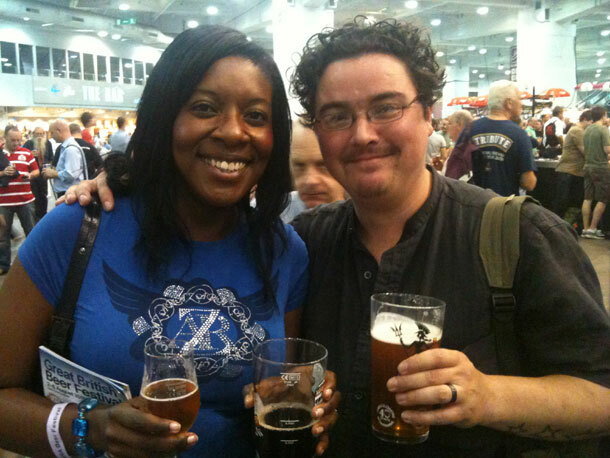 Short of boring you to death with too many picks of me grinning like a crazy Cheshire cat posing with all the lovely beer writers, brewers and members of the public I met, I’ll only post a couple and list what I drank and who I met. 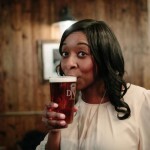 After getting Tony Johnson from Fuller’s in an ever-so-gentle headlock, he organised me a 1-2-1 chat with John Keeling, the London brewery’s ever-congenial Head Brewer about the newly released Brewers Reserve No 3 (their ESB beer which had been aged in whisky casks for over 800 days) And I had my first wondrous taste of it. Needless to say it was mind-blowing. Warming whisky and vanilla flavours in one cheeky sip. Wow. It was only available in limited amounts at the GBBF so there was quite a scrum at the times you can get yourself some at the Fuller’s bar. 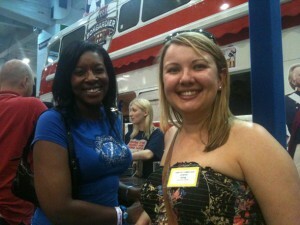 I also met Julia from the Fordham Beers team. 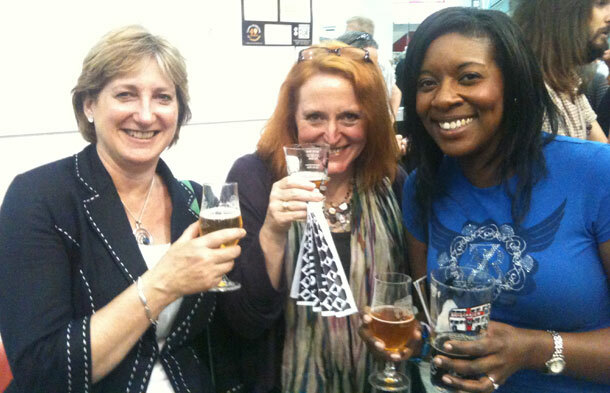 They’d chosen the GBBF to launch their range of new American craft beers at the BSF stand. 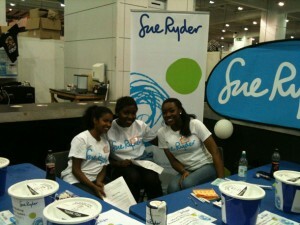 Jo, Liz & I having a good old giggle! And my most fave beer of the festival is.....? On (Flying) Visit Number 2 – I had yet more Liverpool Organic Josephine Butler Elderflower Ale, and some O’Hanlon’s Port Stout (see the pic of my mate, Deena enjoying her first EVER porter but don’t ask me HOW we got ourselves into the mess of her wearing a Brain t-shirt but not drinking Brains Stout. Eeeek!). 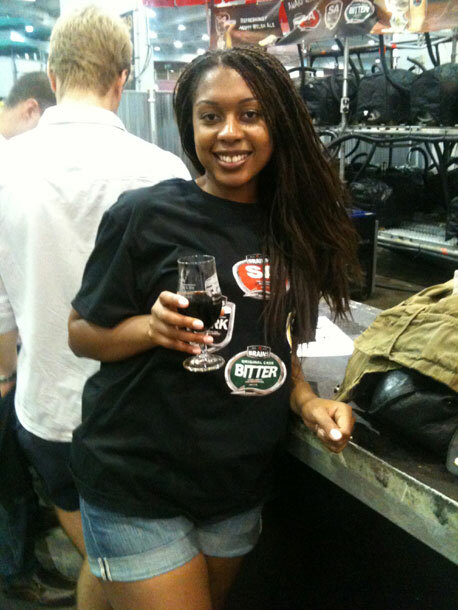 And then I went on the hunt for some Mighty Oak’s Oscar Wilde – the Mild which won this year’s Champion Beer of Britain. But the latest barrel had just ran out, so I had to opt for my second choice (but it was by no means a second choice!) 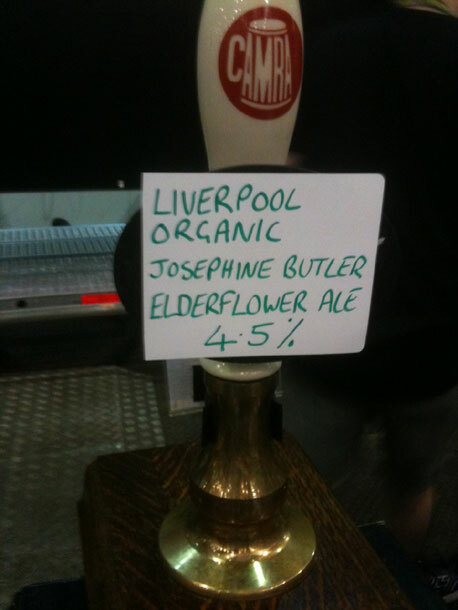 Otley Brew Co’s O-Garden which was magnificent. All-in-all it was a terrific couple of days, so cheers, GBBF! I’m looking forward to next year. 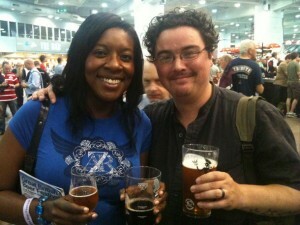 2 Responses to Cheers, GBBF! 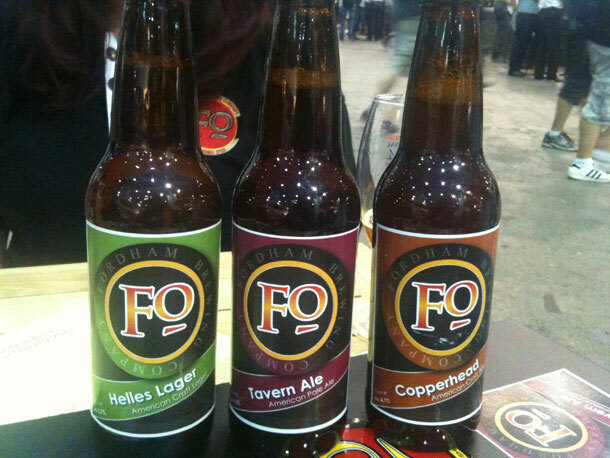 Did you come to the BSF bar to buy those Fordham beers? Maybe I met you after all then as I sold plenty of those! hey Stephanos, no I didn’t come to the BSF for the Fordhams cos I had a special audience with their marketing team. Shame I missed you!! Hope it wasn’t too much of a knackering week!